[Image: SkyBuilt Power's Mobile Power Station (MPS)]. Here is another perfect example of the application of modularity to the context of "informality" and the nomadic landscape. Be it to power emergency relief efforts in a disaster zone, or as an infrastructural tool to develop renewable energy for quasi-permanent refugee camps, green energy for squatter communities, or, even more obviously, serving in the urban trenches of an insurgency/counter-insurgency warfare, SkyBuilt's Mobile Power Station (MPS) is a revolutionary approach to delivering the rapid deployment of "open source" power stations to the terrain of a nomadic urbanism. 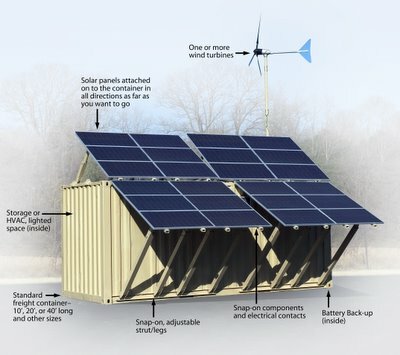 These could be the batteries for a future of "open-source warfare," or "open-source disaster relief," "open-source squatter-settlement construction," rural agricultural renewal, remote border-crossing communities sharing energy directly over or through barrier fences, the MPS quickly becomes an optimal modular unitary-based energy system for floating populations emerging from any number of different scenarios. 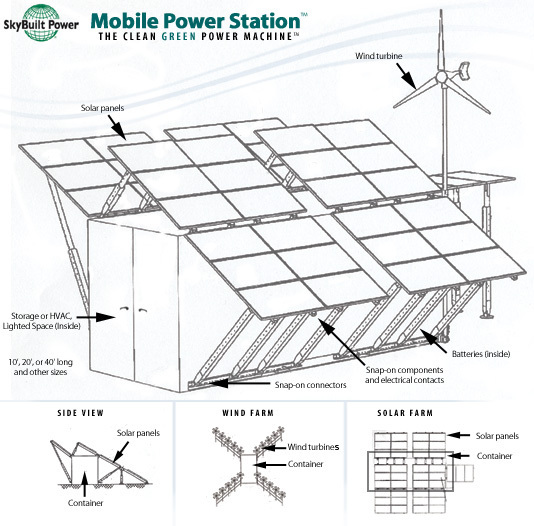 [Image: SkyBuilt Power's Mobile Power Station (MPS) - Schematic]. Hoping to become "the Dell of Renewable Energy Systems," the MPS offers a PC-type plug-n-play shipping container box for distributed generation of energy on and off the grid. 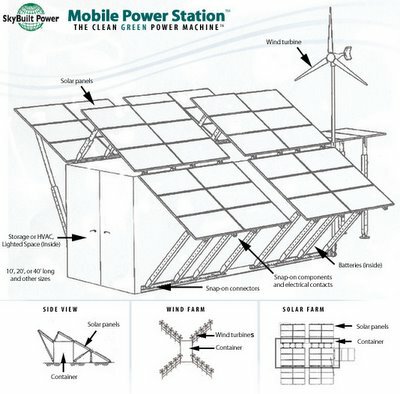 As WorldChanging points out, "combining modular solar panels, wind microturbines, batteries, and plug-ins for fuel cells and biofuel-friendly diesel engines, the MPS can generate a constant 150 kilowatts, can operate both off-grid and in parallel with grid power, is rugged enough to be dropped via parachute, and requires so little maintenance that a solar/wind unit has been operating continuously without being touched for over a year." As powerful and promising as that may sound playing into the future of humanitarian urbanism, Jamais Cascio also raises an important issue: with the prominence of CIA investment in the MPS (which the President of SkyBuilt points out in following comments on the entry - was not developed by the CIA, they've only taken interest after the fact), will other countries steer away while the stigma of the CIA has historically produced a reluctance through out the rest of the world to buy into the legitimacy of such tools? Perhaps, so. But I think we need to accept to a certain degree that the future tools of humanitarian design will remain largely connected to military prototyping, and we would be better off figuring how those tools coming down the pipeline as an "Open Source Architecture" can be co-opted and recontextualized for humanitarian purposes, rather than abandoning them for fear of their dominant military application. If we face the challenge of getting the field to recognize that, perhaps in their own gravitation towards self-mobilization (and even an unconscious self-militarization), they will discover the neutraility of such tools on the open-market like this one, where they belong. Dave Muchow, the President of SkyBuilt reminds us, the MPS was developed "by three regular guys in the old Arlington Bowling Alley," not the CIA.